Papers: In Alabama Farm Bureau Federation Records, 1922-1980, approximately 47 cubic feet (1 foot congressional correspondence). Correspondence between Congressmen and Farm Bureau officials concerning legislation. A finding aid is available in the repository. Papers: 1965-1984, 253 cubic feet. 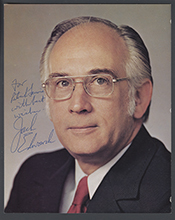 The collection spans Jack Edwardss twenty-year congressional career and includes congressional office and subject files; constituent correspondence; departmental documents; files related to the operation of his congressional office; appointment books for 1965-1981; and papers related to his district visits. These are supplemented by Republican Party and convention materials as well as speeches, legislation, news releases, voting records, photographs, and audio and video cassettes. Of particular interest are files related to Edwardss Defense Appropriations Subcommittee assignment; his stint as vice chair of the Republican Conference; Vietnam; school busing and desegregation; George Wallace for President campaign; the Tennessee-Tombigbee Waterway and other waterways in the first district; and matters related to the Watergate scandal, including the impeachment proceedings and later pardon of President Nixon. A finding aid is available in the repository. Audiotape: 1972-1984, approximately 280 hours of audio tape. The audio tapes are from the Jack Edwardss Talk Show.